Good morning, Nashville. More than 5,000 people turned out to Nashville’s free World Cup watch party at LP Field yesterday. 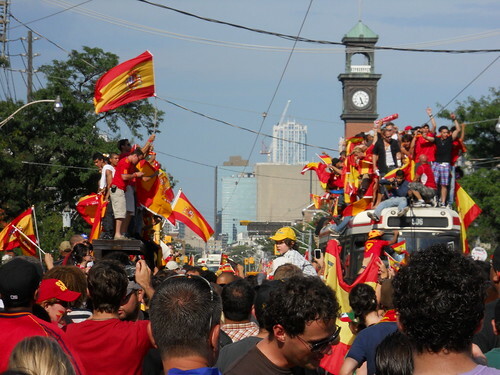 Though we didn’t exactly have folks dancing on top of buses and such, we hear it was a pretty crazy party. There were giveaways, and inflatables, and most importantly vuvuzelas! Meanwhile, the Nashville Convention & Visitors Bureau was there gathering enough photo and video evidence (hopefully!) to prove that we are a soccer-loving town and FIFA should drop everything and give us the 2018 or 2022 World Cup immediately. Is it a little far-fetched? Sure. But we’ve already made it through a few rounds of cuts, it would pump an estimated half-billion dollars into our economy, and it would also just be pretty badass. Vote here! Almost up. Even with all of the election talk, we sometimes forget that Governor Phil won’t be Governor Phil for much longer. Despite the quickly-approaching end of his term, he’s vowing to continue working hard until it’s time to pass the torch. Don’t forget your rain boots. Our weekend turned out to be a little soggier than we anticipated, and it looks like the rain is going to keep up for the next couple of days. The good news is that it should be a little cooler today and tomorrow before the blazing heat returns later this week. Bits & pieces. The Natchez Trace bridge is beautiful, but deadly … A big shoutout goes to last week’s Little People of America convention, which brought $2.5 million in revenue to Nashville … Taco Mamacita is finally able to sell normal beer … We’re not sure we’ll ever be able to forgive Hank Williams Jr. for this.